One of my favorite holiday flavors is hands down gingerbread. The sweet and potent flavor of molasses has always been one of those flavors and smells that I just couldn’t ever pass up this time of year. We love cakes around here, but above all this is one of our favorite cakes. Not just because it’s getting to be the snowy season but because it is super addicting and the flavors together are just magical. 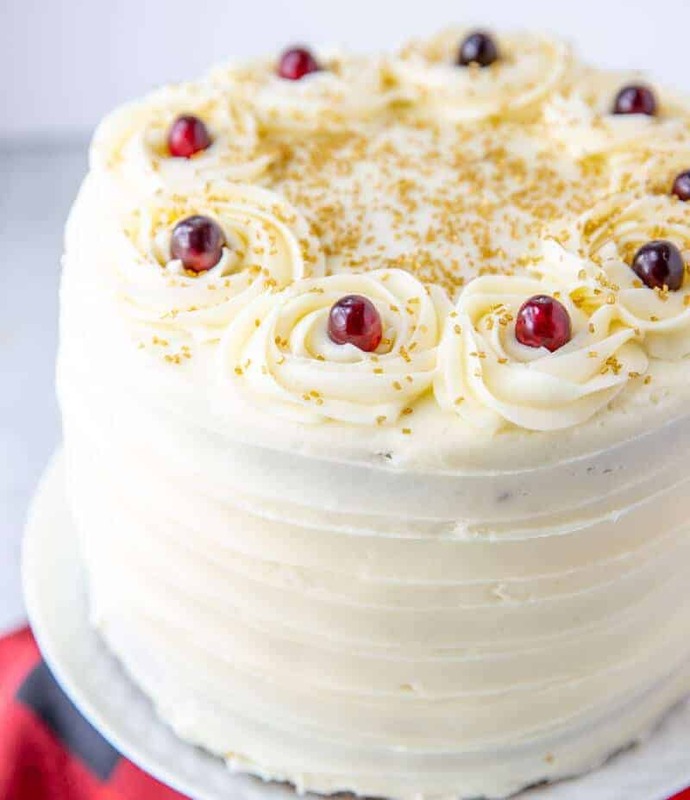 This Gingerbread Cake recipe is 3 layers of moist and fluffy goodness that is filled with a white chocolate whipped mousse filling and frosted in a creamy cream cheese frosting. Now when you have all those depths of flavors there is no denying that this cake is pure goodness at it’s best. Trust me when I say that all three of these flavors just work so well together and you can taste each in ever single bite. My kids love building gingerbread houses, I on the other had have not been to proficient on actually building them so thank goodness they still make them in school. It doesn’t really matter that they use milk cartons and graham crackers, its still something fun that they can do for the holidays. One day when I really get into honing those skills we will whip up a fun gingerbread house for the blog, but until then you will have to stick with this cake. There are so many recipes that we just flock to this time of year to just enjoy the short gingerbread window that we can, because we are truly and utterly addicted to any and all the things. Now growing up we always made gingerbread cookies. More or less the soft ones that you roll into a ball and then in sugar and flatten with a cup. We have so many memories sitting in my grandmas kitchen, actually that is one of the last memories I have of her before she passed away a few years ago. 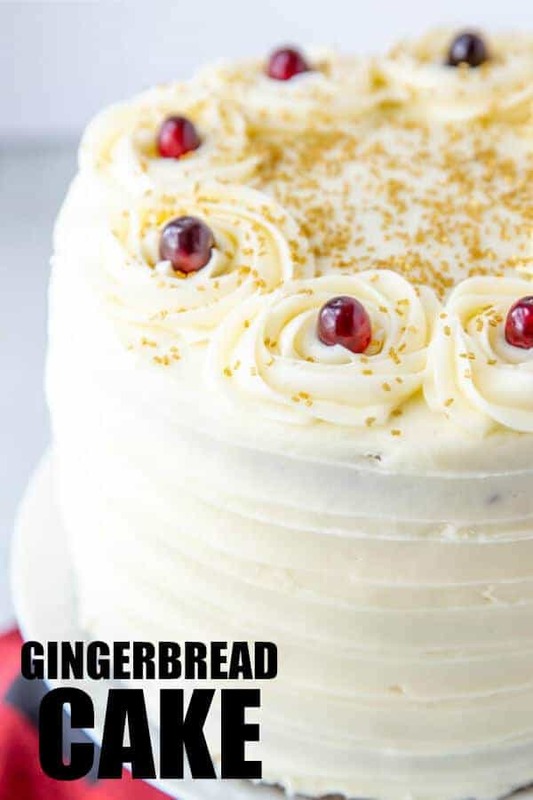 I can honestly say that spending time baking Christmas cookies with here is one of the main reasons why we love this gingerbread cake recipe even more. WHAT INGREDIENTS DO YOU NEED FOR THE CAKE? 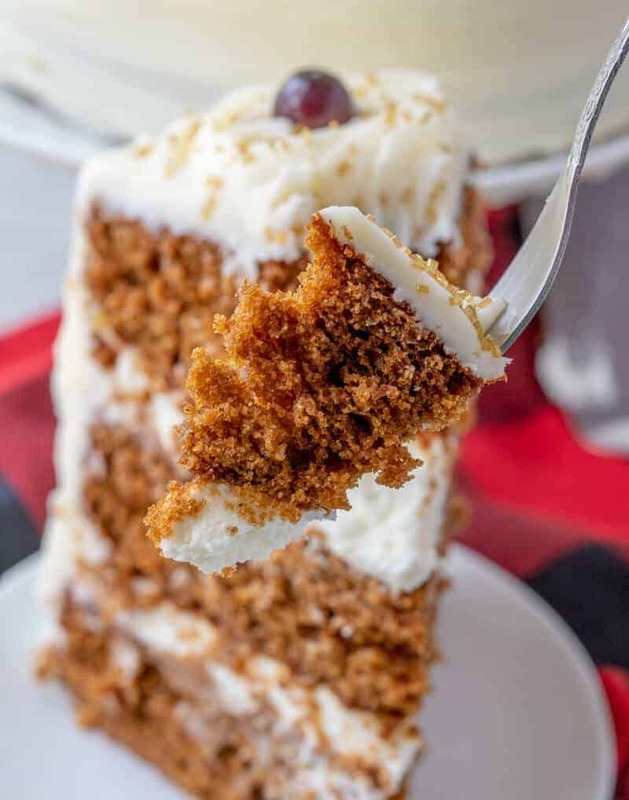 The combination of the spices and molasses really makes gingerbread cake what it is. Let’s face it, molasses on it’s own is pretty nasty, I won’t lie. Its crazy how just adding some spices and sugar and something that normally is gross on it’s own becomes something irresistible. Spray 3 8″ round cake pans with non-stick cooking spray and line with parchment paper, set aside. In bowl with electric mixer or in bowl of stand mixer, mix together your butter and sugars until light and fluffy, about 2-3 minutes. Add in your molasses and eggs and keep mixing until smooth. Once everything is blended, distribute evenly in prepared pans and bake for about 25-30 minutes or until cake springs back and toothpick comes out clean. Frost cake as desired if you choose to not use the recipe below for filling and frosting. 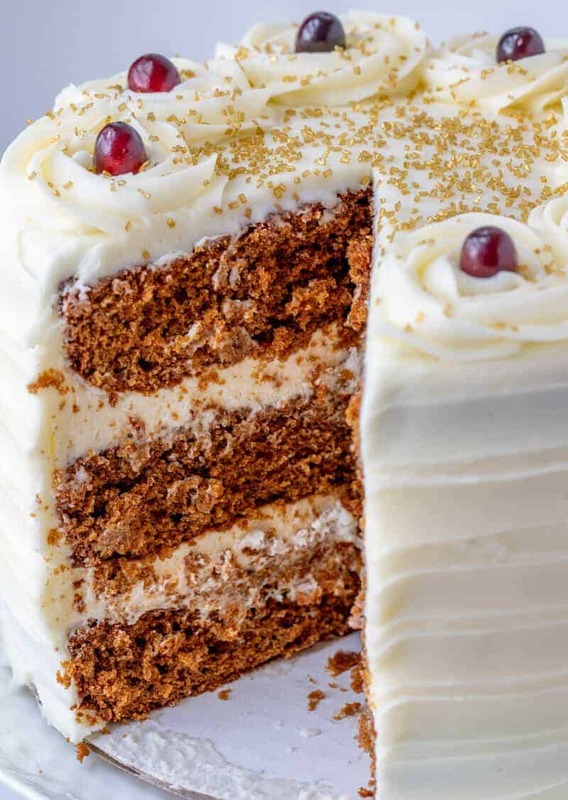 We love our gingerbread cake with a little bit of cream cheese frosting on the outside, but we wanted to switch it up and go with a different kind of filling for the inside. This white chocolate mousse is the easiest recipe ever. With only a few ingredients that includes pudding it whips up in no time and really holds up well. 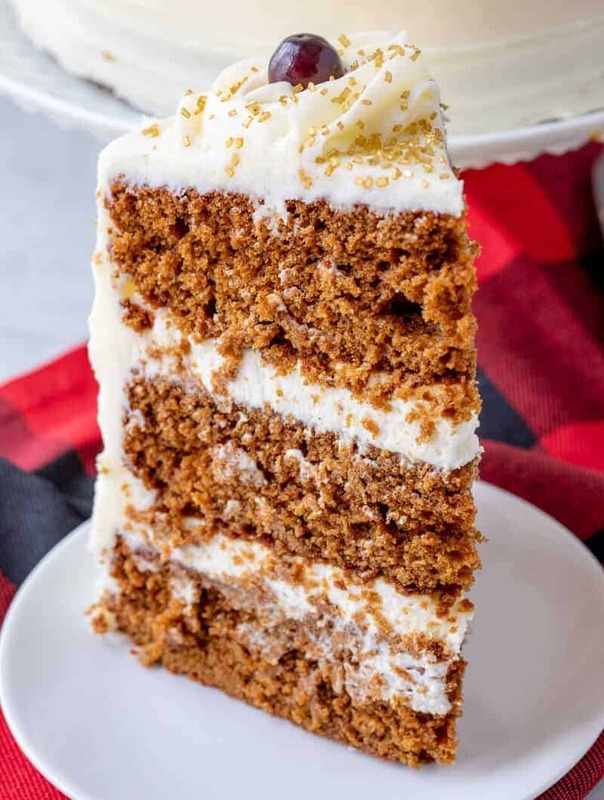 If you are looking for that perfect holiday dessert this Gingerbread Cake is just what you need. Delicious, show stopping and feeds a crowd, one treat everyone will love. Spray 3" round cake pans with non-stick cooking spray and line with parchment paper, set aside. In bowl of stand mixer add your whipping cream, powdered sugar and pudding mixture and beat on medium speed until thick and fluffy. Add in your vanilla and milk one tablespoon at a time until you reach your desired consistency. In stand mixer beat together your cream cheese and butter until smooth. Add in powdered sugar one cup at a time until desired consistency is reached. 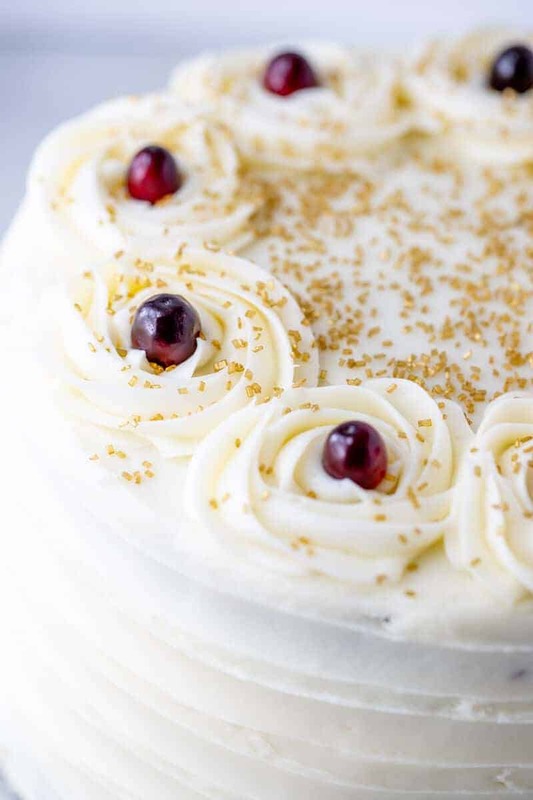 Add one cake layer to cake round, turntable or cake stand. Add about 1 cup of your filling into a piping bag with tip cut off. Pipe an circle around the edge layer of cake to create a dam. Spread about 3/4 of filling into center of cake. Top with another layer and repeat this step and then top with final layer. Frost top and outsides of cake with cream cheese frosting reserving about 1 cup. Place reserved frosting in piping bag fitted with a 1M open star tip and pipe swirls around the top of cake. 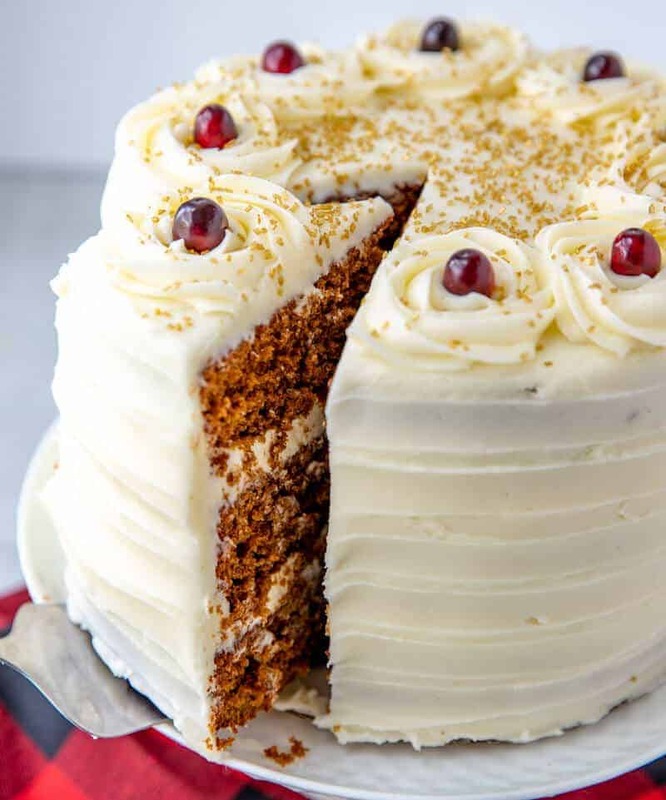 If you want to create the indents around the cake, take an off-set spatula and gently press against frosting and spin cake and drag along cake until you reach the top. 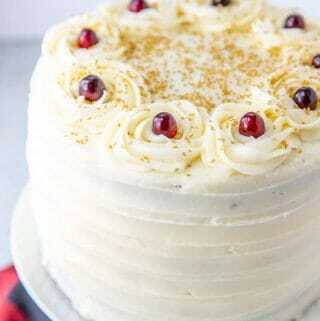 Top your swirls with decorators sugar and cranberries if desired. Oh my goodness!! This cake is absolutely GORGEOUS!!! I love, LOVE the flavors!! YUM!! Wow, that is such a a gorgeous cake, I want to dive into it head first! This is definitely happening for Christmas! This looks heavenly! This looks incredibly delicious! OH my goodness!!! Who doesn’t love cake!! !